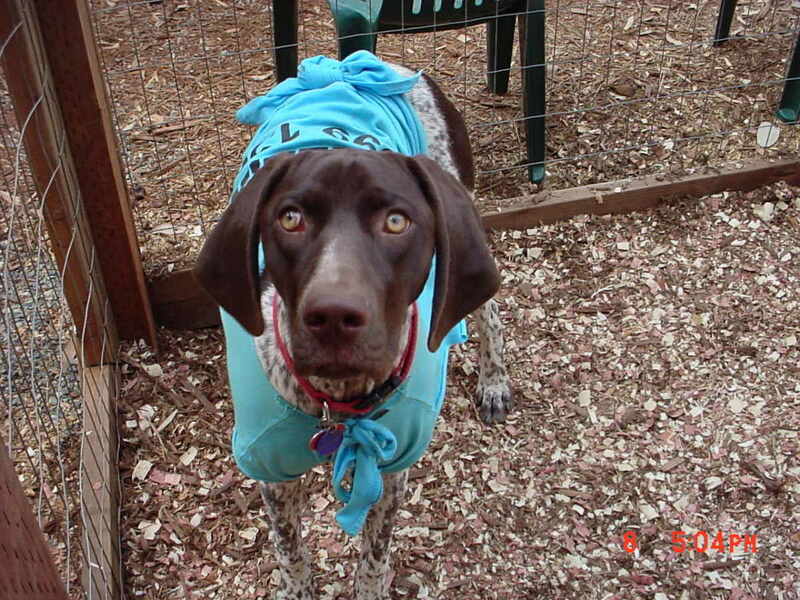 Ivy is a 6 year old German Shorthair Pointer. Now that she is 6 years old, she has calmed down quite a bit, but when she was a puppy she would run like the wind and end up running into a fence or sharp stick in the woods and hurt herself. She got stitches so many times the vet said he was going to put in a zipper. Here she has a T-shirt on to keep her from chewing on her stitches. She does not look happy at all, being under house arrest. Ivy is so cute! German Shorthairs are the best dogs ever. We had two of them when our boys were little. My husband took our boys to pick out one puppy from a litter of two. Needless to say, they couldn't leave one behind, so we ended up with two. Thank goodness we lived in the country so they had lots of space to run. We enjoyed them so much Give Ivy a hug for me.